Home › About Somatic Experiencing › What is Somatic Experiencing® › What is trauma? SE maintains that the post traumatic stress response is neither physical illness nor mental illness. It is a description of someone’s attempt to manage overwhelming and distressing events. However, when the experience of trauma is unintegrated or “frozen,” people can develop symptoms relating to physical or mental health for which medical intervention is sought. Trauma may begin as acute stress from a perceived threat to life or as the product of cumulative stress. Both can seriously impair a person’s ability to function with resilience and ease. It may result from a wide variety of stressors such as accidents, invasive medical procedures, sexual or physical assault, emotional abuse, neglect, war, natural disasters, loss, birth trauma, or the corrosive stressors of ongoing fear and conflict. The SE approach teaches that trauma is not caused by the event itself, but rather develops through a person’s attempt to process adverse events in the body, psyche, and nervous system. It is an embodied experience, which means it is felt and encoded in every system of the body. When terrible events happen the instinctive response is for fight or flight – to escape or fight back. When neither of these are possible – you are too small / young / frightened / cornered/ captured/ weak/ alone etc, the human system shuts down and freezes at the height of the experience. This ensures survival. The human system is disregulated as a result of trauma i.e. the easy rhythm of getting things done, of rising to the occasion, completing, withdrawing and resting is knocked out of synch. The result is that the system remains in this “frozen” state with all the physiological responses – behaving as if the event was continuing and this whilst people continue with ostensibly ordinary lives – rear families, go to work, care for relatives, get involved in community activities. This survival ability illustrates that the human system wants to complete the fight/flight response in order to return to equilibrium and well-being but as it is frozen, this is not possible. This situation forms the basis of the emerging symptoms as the person struggles to shake of the experience and return to “normal”. Surviving trauma requires a huge charge in the system to enable the completion of the defensive instinct of fight or flight. When this charge cannot be used up, people suffer great distress resulting often in unexplained pains, aches, sleeplessness and medical conditions and behaviour reflecting the attempt to manage the overload e.g., addictive behaviour, over medication, explosive and inappropriate responses, depression, mood swings, painful confusion, despair, self harm and suicide. All of these also affect those sharing their lives. People usually seek support when the impacts of trauma and how they have been trying to manage their lives is not working anymore. When these become intrusive to living well in daily life, many people seek medical intervention for symptom relief, in the first instance. Then – often as a result of a referral by the GP – they seek other forms of help. For many this becomes an endless, repetitive, often despairing, search for ease and relief. Many interventions e.g. medical intervention help to reduce symptoms in the short term. This relief is to be welcomed though it must not be seen as the resolution or integration of the impact of the events. Short term interventions do not educate the physiology to reorganise and re-establish equilibrium. 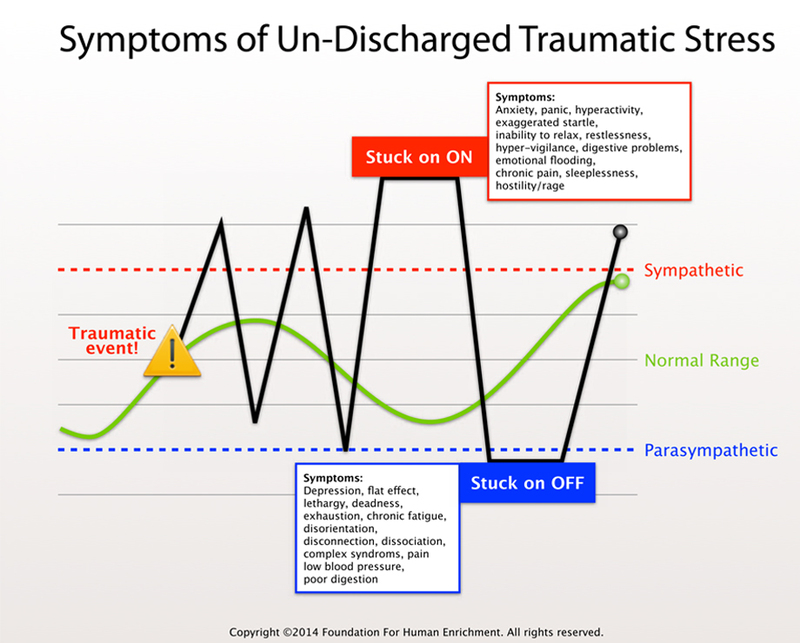 The purpose of trauma support must be to reset this rhythmic movement of ease and resilience. It is important to note that, whilst every human being shares the same physiological response to trauma, each of us has a unique personal history. The meaning we make out of events will be unique and expression of the traumatic experience will reflect this unique history. In addition, family style and cultural context and expression will influence our unique responses. They structure our memory, meaning and emotional responses and consequently our behaviours. Of course, these responses are not compartmentalised but function together in a complex way to help us to survive. Not everyone who has experienced trauma will need individual psychotherapeutic support. A significant number will do so. However, in addition what everyone needs is information and guidance to understand the impacts of trauma and how to work with that. Although humans are designed to rebound from high-intensity survival states, rationalisations, judgments, shame, and fear of our bodily sensations, may impede our innate capacity to self-regulate in the aftermath of such events and leaves us with patterns of relating that reflect how we have managed to survive. When the nervous system does not reset after an overwhelming experience, sleep, cardiac, digestion, respiration, and immune system function can be seriously disturbed. Unresolved physiological distress can also lead to an array of other physical, cognitive, emotional, and behavioural symptoms including distressing medical conditions. SE is designed to help clarify these patterns, and to develop tools for restoring our innate capacity to integrate the experience and live well.